"Love 'Em Leave 'Em" is back after I had missed week 8. Sorry about that. Hopefully, you all pulled out a win in your league! Right now is when lineup decisions matter most. Teams are starting to be eliminated from playoff contention and every week matters. Who knows, which waiver wire tight end you start might be the difference between fantasy champion and fantasy scrub. Let's get to some loving and some leaving. Love 'Em: Russell Wilson vs. WAS: Russell Wilson has been on FIRE recently. He has over 25 fantasy points in 4 of his last 5 games. He recently stood toe-to-toe with Deshaun Watson, leading Seattle to a 41-38 victory. Seattle doesn't have much of a run game to speak of which means they'll be relying heavily on Wilson to lead them to a 5th straight victory. There are very few quarterbacks who even have a case to be started over Wilson this week. Leave 'Em: Marcus Mariota vs. BAL: Marcus Mariota has not been himself this year. He hasn't gone over 20 fantasy points in a game all year and scored 9 points in a dream matchup with Cleveland last time he played. He gets Corey Davis back this week, but don't be fooled. Mariota faces an intimidating Baltimore defense that has allowed the second-fewest points to QB's this year. It's tough because a lot of QB's are on byes, but hopefully, there is a better option than Mariota. Love 'Em: Christian McCaffrey vs. ATL: The Falcons are terrible when it comes to guarding pass-catching backs. I don't remember the stats, but I know that they definitely allowed the most catches to backs last year. Just last week Matt Forte was able to catch 6 passes. Imagine what McCaffrey, the RB/WR can do. With Kelvin Benjamin gone, Carolina wants to spread the field, which can only mean good things for the rookie. I should be putting McCaffrey in the receivers section. Leave 'Em: Jay Ajayi vs. DEN: On this week's edition of "Sit the running back against Denver," we've got newly-acquired Jay Ajayi. All the signs point to a bad week for him. Eagles reporters are saying he'll have a very limited set of plays. The coaching staff came out and said that LeGarrette Blount was still the starter in Philadelphia when all of this happened. Oh, and he plays Denver. Denver's run defense is absolutely incredible. They shut ABSOLUTELY everybody down, other than Orleans Darkwa. Somehow. Ajayi's good weeks will come. This is not one of those weeks. 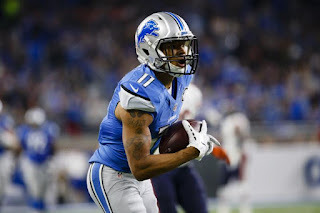 Love 'Em: Marvin Jones @ GB: Marvin Jones has been balling in Detroit. I barely even realized it. He's got 5+ catches for 50+ yards in his past 3 games. The entire Lions offense seem to be heating up and Jones is playing a big part in that. He's a big body guy and works well with Golden Tate, who will also be active at Lambeau. Jones is in for a big week and should be trusted as a high-end WR2. Leave 'Em: AJ Green @ JAC: Cincinnati's offense has gotten better since they fired their offensive coordinator, but it's still not where they'd like it to be. Outside of a game against Cleveland. the passing game hasn't really been anything special. Obviously, that affects AJ Green. Green travels down south for a brutal matchup against Jacksonville this week, who own an incredible defense. They've got, legitimately, too many good guys on the defensive line, an athletic linebacker core, but most importantly, an incredible secondary. Green is really the only option for Andy Dalton so Jacksonville would be smart to key in on him. Green will still appear in lineups as he should, but like I always say, temper your expectations. Love 'Em: Jack Doyle @ HOU: Jack Doyle had a big game last Sunday, hanging 12 receptions for 121 yards and a score on the Bengals. This week he gets Houston, who have allowed the 7th most fantasy points to tight ends on the year. Doyle and Brissett are building a solid connection, which is big considering Andrew Luck is out for the year with a shoulder injury. Doyle's a strong play this week. Leave 'Em: Eric Ebron @ GB: Please do not be fooled by Ebron's respectable game against Pittsburgh. He still couldn't catch a beach ball. Darren Fells is the new starting tight end for Detroit, not Ebron. This week, I'm sure he's going to commit an early first quarter drop and go back to being completely irrelevant and watching from the sideline. He wasn't moved at the deadline which basically means he's stuck being mediocre in Detroit.